Environmental sustainability is the ability to keep ecological processes within an ecosystem and its biodiversity in the future and, together with economic and social sustainability, contributes to the definition of well-being and progress. In this frame, circular economy and holistic approach in planning urban areas and designing public and private buildings play a decisive role. In the case of restoration, it can even be critical to achieve the best compromise between the desired acoustic quality and the architectural constraints imposed by the structure being restored. Software for simulating sound response in enclosed spaces can help to solve this issue. 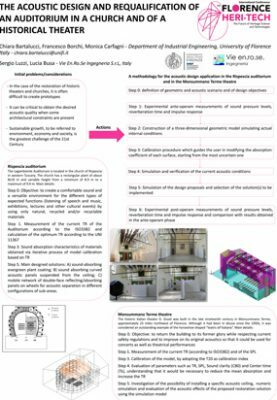 The paper reports the numerical-experimental method used for the acoustic design and main results obtained in the acoustic requalification design of a church and a historic theater, both located in Tuscany (Italy). In the first case study, a requalification procedure was devoted to transform the church of Rispescia in a multifunctional auditorium by using sustainable materials. The study and design are referred to a building with a significant volume of approximately 1300 m3, where the presence of finishing materials and reflecting furniture determined a high acoustic discomfort, making the hall difficult to use for events like lectures and concerts. After the implementation of the designed interventions, the church has been regularly used for different functions. In the second case study, the proposed method has been applied for the acoustic restoration of the historic theater of Monsummano Terme by modifying its former acoustic design and thus extending its use to include concerts in addition to theatrical performances.